Foreclosure pace slows, but short-sale pace picks up as banks try to avoid the expense of maintaining and reselling seized homes. The pace of completed home foreclosures slowed a bit in August nationwide, as banks increasingly turned to so-called short sales to avoid the lengthy process of seizing, maintaining and selling properties. The pace of home seizures still varies widely on a state-by-state basis. Illinois had the highest foreclosure rate in the nation last month at roughly one out of every 300 homes in some stage of the process, with both foreclosure starts and completions rising. Florida, California, Arizona and Nevada were also among the top five states with the highest foreclosure rates in August, according to the latest figures from RealtyTrac, a research firm that tracks foreclosures. The wide variation reflects both the regional nature of the housing bust and differing state laws governing the foreclosure process. Some states have passed laws that have slowed the process. As the pace of home seizures eased, foreclosure starts across the country edged up 1 percent from July, to about 99,000. But that pace is still 13 percent lower than August last year, according to RealtyTrac. The foreclosure process slowed sharply in many states that require courts to review home seizures after a barrage of legal challenges to the process lenders use to seize homes. As those backlogged cases work their way through the system, in states like Florida and New York, the pace has picked up again. In many so-called non-judicial states, like California and Arizona, where there have been fewer cases backlogged, the number of foreclosure starts has declined. The loss of homes remains highly concentrated in a handful of hard-hit states, with nearly half of all completed foreclosures in July coming in just five states, California, Florida, Michigan, Texas and Georgia, accounting to a separate report from CoreLogic. While the pace of foreclosures is expected to continue to decline gradually, that trend won’t necessarily slow the pace of households losing their homes. “Servicers increasingly rely on alternatives to the foreclosure process, such as short sales and modifications," said Mark Fleming, chief economist for CoreLogic. In a short sale, a lender agrees to accept less than the full mortgage balance when a home is sold. The process saves the lender the cost of maintaining and reselling a foreclosed property. 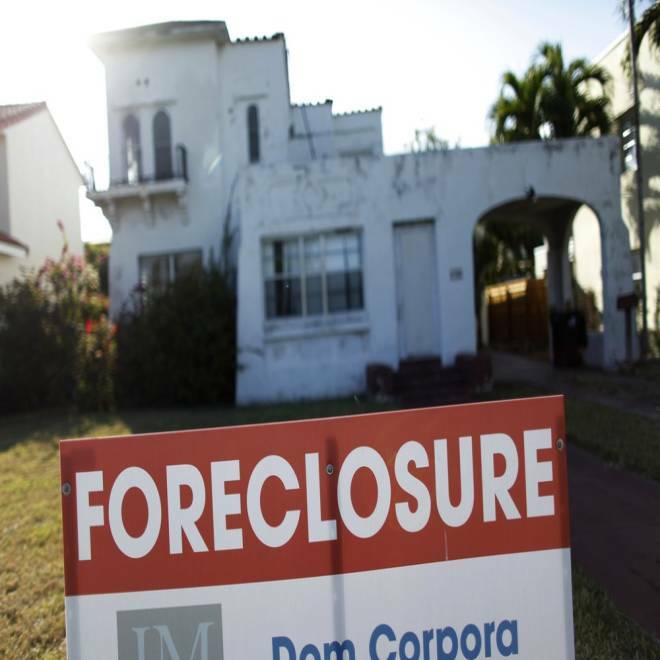 The decline in the pace of foreclosures also comes as five of the biggest U.S. lenders -- Bank of America Corp, Wells Fargo & Co, JPMorgan Chase & Co, Citigroup Inc and Ally Financial Inc -- ramp up alternatives called for in a landmark $25 billion settlement with states reached in April. Last month, the monitor overseeing the settlement reported that those lenders provided $10.6 billion mortgage relief in the first four months of the program, most of which represented approval of short sales. Attorneys general in the 49 states that negotiated the deal had hoped the settlement would prod more lenders to modify loans and write down principal balances for underwater homeowners. So far, lenders have provided $1.3 billion in those writedowns, according to the monitors report. Bank of America Corp., which is required by the settlement to provide the largest portion of the relief, $8.6 billion, hadn't completed any modifications of first-lien mortgages or refinancings as of June 30, according to the report. The pace of principal writedowns has also been slowed because the federal regulator overseeing Fannie Mae and Freddie Mac has refused to allow the writedowns. Fannie and Freddie hold more than half of all residential mortgages. The $1.3 billion in principal writedowns by the five big lenders is a drop in the ocean of underwater mortgages. Nationwide, homeowners with mortgages owed some $689 billion more in the second quarter than their homes were worth, according to CoreLogic. The recent uptick in home prices is providing minimal relief; that number dropped by just $2 billion from the first quarter to the second quarter. Of all homeowners with mortgages, some 10.8 million – more than one in five – were still underwater in the second quarter, according to CoreLogic. Much as foreclosures remain concentrated in a few states, borrowers are most likely to be underwater in states that suffered the steepest house price declines. In Nevada, nearly 60 percent of mortgaged properties are underwater, followed by Florida (43 percent), Arizona (40 percent), Georgia (36 percent) and Michigan (33 percent). Those five states account for just over a third of the so-called “negative equity” in the U.S. Most of those borrowers, nearly 85 percent, are still paying their mortgages, according to CoreLogic.